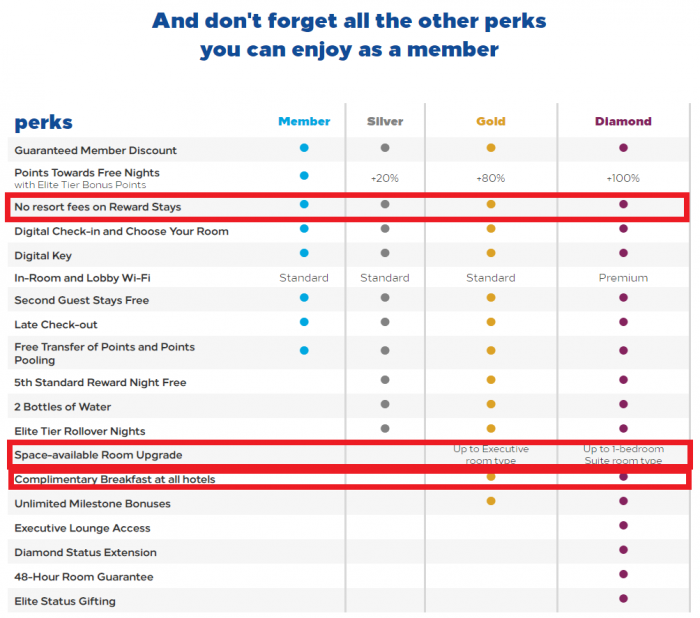 Hilton Honors updated late last week the elite benefits grid that you can find on their website clarifying resort fees, breakfast that applies to stays at ALL hotels and Diamond member upgrades. Seems that Hilton Honors here is sending a message to Marriott Rewards that is struggling with its program at the moment and whose members are furious with the failing merger (especially SPG ones) that continuous to have never ending “technical issues”. You can access Hilton Honors updated grid here. Here Hilton Honors clarifies that there are no resort fees on award stays period (Marriott Rewards charges them and can be up to $50 or more per night). Gold and Diamond members are eligible for breakfast for two at all Hilton Honors affiliated hotels (where it is a complete and utter mess at Marriott hotels where you need to have PhD to understand all the rules and even then carry a cheat sheet – read more here). The Gold and Diamond member upgrades are also better spelled out here. Diamond members are eligible for suite upgrades while Gold members can be upgraded up to executive rooms. Just a reminder that Marriott Rewards ended their Rollover Nights while Hilton Honors launched them. There are no additional benefits here but easier to understand for new program members to what they are eligible for. You have to keep in mind, however, that Hilton Honors doesn’t have well defined late check out like Marriott and Hyatt have for their top tier members (4PM). Hilton’s is based on availability and not guaranteed that I don’t like. I know that breakfast is very important for many (I tend to skip it on most morning like today) and you can be guaranteed to get it at all Hilton Honors affiliated brands as Gold or Diamond.